It’s our Big Green Egg Giveaway – Week Two! That’s right! 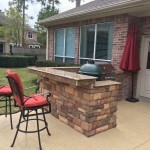 On April 7, 2014, we here at Outdoor Homescapes of Houston announced we’d be giving away a large Big Green Egg grill (the most popular model, with an estimated retail value of $849) to anyone getting a custom outdoor kitchen designed and built by us! The Big Green Egg promotion is a fun way to kick off the season after a particularly cold, wet, miserable winter. To participate, all you have to do is go to our Big Green Egg Giveaway website page or our Wishpond Big Green Egg Giveaway landing page! What’s a Big Green Egg? For the uninitiated, a Big Green Egg is a kamado-style ceramic charcoal cooker. Not only is it versatile, with the ability to function as a grill, oven or smoker – its airtight ceramic chamber retains heat and moisture, rendering food juicy and delicious! We’re talking restaurant quality! The thing with the Big Green Egg and other kamado-style cookers is, you need to lift them to a proper working height. You also need to provide them with working and serving space. 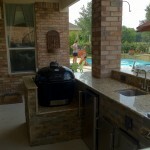 Although you can buy Big Green Egg tables and metal stands (called “Big Green Egg Nests”), people are gravitating more to cabinets and islands for their outdoor kitchens – so they can keep all their outdoor appliances and amenities functionally – and aesthetically – coordinated. Why Big Green Egg islands? 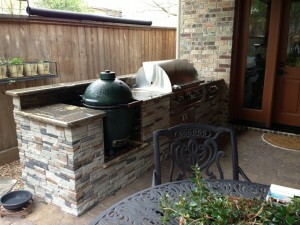 Here’s a gallery of some of our Big Green Egg islands. And we’ve got to tell you – people love them! 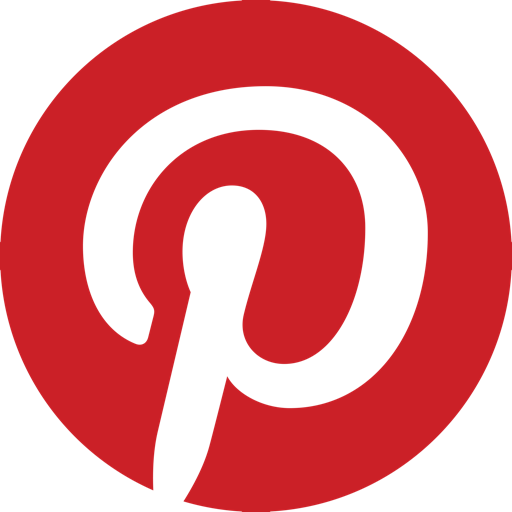 In fact, our Big Green Egg islands on Houzz are by far our most popular images on the site. 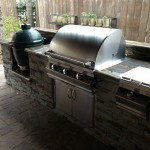 Interested in getting your Big Green Egg for free? Well, you’ve only got two weeks left! So visit one of our Big Green Egg Giveaway pages (above), or just contact us today!